There’s a promotion running at Mr Green Casino today (Friday the 22nd of March 2019) which can give you up to 50 bonus spins on the volatile Wild Falls slot. Valid until 22:59pm UK time tonight, you can get up to 50 bonus spins. 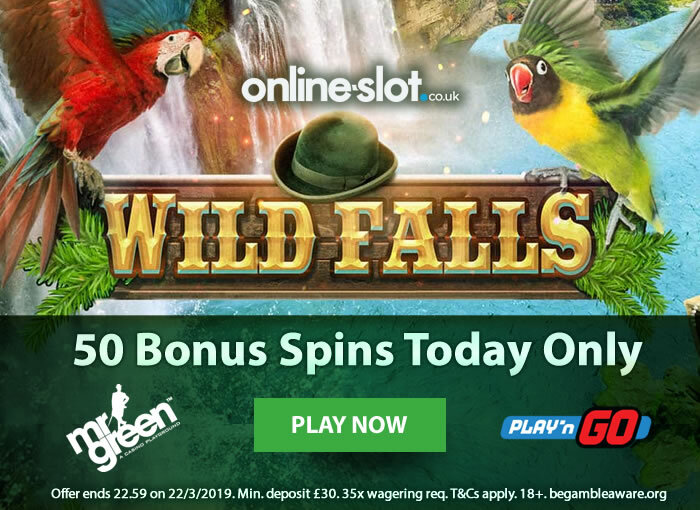 Firstly, you need to opt in to the promotion (done from the homepage once you log in) – then you will get 1 bonus spin on Wild Falls for every £1 you deposit. If you were to deposit £50, you would get 50 bonus spins. The minimum you can deposit for this promotion is £30 (which would give you 30 bonus spins). Wild Falls is powered by Play ‘N Go and their potentially most rewarding slot – with 5 reels and 20 paylines, you’ll hopefully strike it lucky in this Gold Rush. Playable from just 20p a spin on all devices, it’s beautifully designed with the iconic Yukon River in the backdrop. With mining equipment represented on the reels, look out for treasure chest wild/scatters as this flow down the river and waterfall – they can fall onto the 3 middle reels. When 1 lands, the Rapid Respins feature comes into play. The treasure chest locks in position with a free respin – more treasure chests will lead to more respins. If you get 3 treasure chests on the reels at once, you will play the River of Gold Free Spins feature – the treasure chests now shift down 1 position after every free spin. With more wilds appearing, the feature only ends when no treasure chests are left on the reels. The Gold Rush feature is randomly activated and transforms treasure chests into golden ones – these have multipliers up to 5x which can combine to give you multipliers up to 125x.